Rural mailboxes have requirements that are particular to the environment in which they function. They are generally isolated from constant view and are installed along a roadside sometimes quite a distance from the main residence. A USPS rural mailbox location is required to be approved by the Postal Service and must be installed on the right-hand side of the road. When choosing a mailbox for open rural areas, the security of your mail is a major consideration. Rural locking mailboxes offer the benefits of a strong and secure mailbox plus the ability to reflect your personal style with decorative options. Decorative mailboxes need not be isolated to only suburbs and crowded neighborhoods. They are perfect for rural homes as well. Decorative rural mailboxes are sturdy and can be made from wood (like our Cedar Mailboxes), cast aluminum or galvanized steel that is covered in durable powder coats for lasting protection. A unique rural mailbox is also important when you want your mailbox to function as a display of your favorite animal, hobby, sporting activity or other interest. 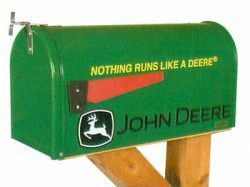 Check out our John Deere Mailboxes. Every type of rural mailbox design is available including themed designs such as Novelty Bird Mailboxes, Farm Animal Mailboxes, Sport Novelty Mailboxes and rural mailboxes that resemble country homes, barns, schools, and churches. A post mounted rural mailbox that includes a decorative design can be a stylish example of your taste and represent your property and rural home setting well. Whether you are looking for a classic post mount mailbox or a more modern looking rural mailbox, check out our extensive selection of decorative Curbside Post Mount Mailboxes, ideal for both urban and rural settings. Many rural mailboxes can also be customized with Address Plaques or custom Mailbox Numbers and Letters based on your preferences. You can view the various options available online or speak with us directly about particular custom options available. Some rural mailboxes may require extra space for mail and other packages including room for magazines and newspapers. If you don’t access your rural mailbox every day, you’ll want this feature to ensure there is adequate room for your mail and that it is held secure. Various mailboxes approved for rural residential use have carrying capacities to meet standard rural conditions for retrieving mail. These mailboxes also come in many types of decorative options. Our Copper Rural Mailbox, shown here, is a prime example. Secure and safe mail retrieval is an important issue for residents living in rural areas. Your mail is deposited by the postal carrier at a location often outside of your sight and the eyes of neighbors. Therefore, protection from theft and vandalism is an important consideration when choosing a rural mailbox. The Mail Safe Locking Mailbox shown here is a fine example. Rural locking mailboxes are the answer to this problem. All locking rural mailboxes come with exclusive keys and sold hardware to ensure a safe holding place for your mail. They are made of solid materials, commonly cast aluminum with special coating, and can be just as decorative as standard residential mailboxes. The addition of a unique rural mailbox would make a significant improvement to any home’s overall visual appeal. For more information about unique, post mount rural mailboxes including rural locking mailboxes and large rural mailboxes, please call MailBox Works toll free at (866) 717-4943 or Contact MailboxWorks. 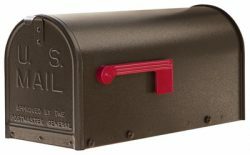 Mailbox Works is your online source for residential Mailboxes plus Home and Garden Décor products.